DNAnexus is excited to announce the launch of Strains #1, the first in a series of Mosaic Community Challenges. A series of community challenges will be hosted through Mosaic and sponsored by the Janssen Human Microbiome Institute (JHMI), part of Janssen Research & Development, LLC, to foster global collaboration focused on advancing the improvement of methods and standards around microbiome science. The Strains #1 challenge will officially run from December 1, 2017 through February 28, 2018. You can learn more about Strains #1 by watching an introduction to the challenge from a recent webinar. 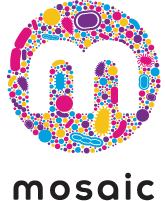 We encourage you to join the Mosaic microbiome community via your DNAnexus account or register for a Mosaic account. Profiling: The ability of tools to correctly identify organisms in a microbiome. Assembly: The ability to reconstruct contiguous sequences (contigs or scaffolds) from metagenomic reads. Binning: The ability to correctly group contigs based on their taxonomic origin. Profiling a microbiome sample is the fundamental step in any microbiome analysis. Current state-of-the-art methods based on next-generation sequencing perform well in correctly identifying organisms down to the genera and species level. However, the performance of current methods at the strain level is poor. Given the fact that individual strains within the same species can elicit different functionality and metabolic response, strain-level identification and quantification is key to the development and tracking of microbiome-based health solutions. It is critical to be able to accurately determine the type and quantity of microbes in a sample at the strain level in order to bring safe and effective products to market, and to accurately monitor their status within the human body. How is the Strains #1 challenge different than previous efforts? Participation is Free: creating tools, running analyses and storing data in the workspace provisioned for each participant in this challenge is free! Participation is responsive: users get immediate feedback on the performance of their submissions. Participation is communal: participants can perform comparisons against the submissions of the community. Tools are easily created and shared: users can create tools using Mosaic’s App creation interface and share them with the community. We’re taking a forward-looking approach: the challenge aims to accelerate innovation and enable the translation of microbiome research to the clinic. Real microbiome samples are studied: real microbiomes that contain known bacterial strains were created and sequenced specifically for the Strains #1 challenge. Anonymity is optional: to encourage maximum participation by both academic innovators and private sector experts, we enable anonymous submissions. Furthermore, participants can download the datasets for analysis on their own computing resources.